The MS Europa 2 is an extravagant, no-expenses-spared luxury cruise ship. The ship’s spacious suites, high ceilings and beautiful design feel so much like a five-star hotel, you may even forget you’re at sea. Its bilingual European service staff can accommodate any need, and will do their best to make passengers feel at home. No more than 500 guests are allowed on each cruise, so you can expect personal service and no crowds. Sleek modern fixtures, contemporary art, and a yacht-like atmosphere complete the environment of contemporary luxury. Hapag-Lloyd is famous for providing high-class cruises with a European flair. 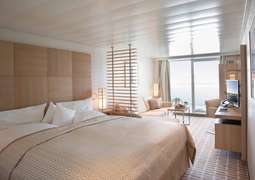 A popular luxury cruise line in its home country of Germany, it is making its first foray into international markets with the MS Europa 2. The ship sails to exotic destinations around the world, providing an absolutely unique travel experience. Take an excursion into the Arctic Ocean and cruise the little-known islands of northern Norway. Or sail to popular destinations and stop at unique ports of call for an unforgettable vacation. Every stateroom on the MS Europa 2 is a suite with a balcony, bathtub and separate living and sleeping areas. The standard suites are a spacious 300 square feet, and passengers can upgrade to a 452-square-foot Grand Ocean Suite or and 840-square-foot Grand Penthouse Suite. Expect luxurious amenities such as in-room Wi-Fi, complimentary tablets and phones for use around the ship, and generous storage space for clothing and luggage. Small touches that make a big difference include a mini-bar that is constantly being refilled, multiple small drawers and containers for storing personal items, and items such as dental floss, a shower cap and a sewing kit in addition to the usual bath amenities. Penthouse suites and above come with personal butler service. Variety is the spice of life, and it’s the defining feature of the culinary culture on the MS Europa 2. With eight onboard restaurants serving mouth-watering masterpieces, even passengers on the longest voyages will not get bored of the food. The MS Europa 2 serves classic cuisines such as French, Asian and Italian, presented in a stylish and modern setting. True gourmets will appreciate the ship’s largest restaurant, Weltmeere, which serves an ever-changing variety of culinary creations. Classic dishes are reimagined in new and innovative ways, and new creations are invented which combine textures and flavors in bold new ways. Diners can enjoy fresh sushi while looking out over the water at the specialty restaurant Sakura, or enjoy dining al fresco at the indoor-outdoor Yacht Club buffet. All restaurants are open-seating. Six bars and lounges provide ample opportunity for after-dinner cocktails, nonalcoholic nectars, or a longdrink on the rocks at any time of day. Every bar can mix any cocktail, and Collins bar boasts the largest collection of gin at sea. Sansibar offers a club-like atmosphere with its dance floor and late-night DJ. And the bar Belvedere is a combination bar, library and café where guests can read the morning paper or sip a cup of tea as they enjoy breathtaking views of the sea. The MS Europa 2 has a number of activities onboard catering to passengers with the most refined tastes. From live jazz bands to spectacular acrobatics, there are entertainment options to suit every fancy. But pay attention to the language of the show– while circus shows and art exhibits are enjoyable in every language, comedy shows and educational lectures do not translate as well. The staff are generally happy to provide accommodations for English-speaking guests. For health and wellness gurus, the Europa 2 leaves little to be desired. An enormous spa facility has treatments and services that cater to your every wish, and a separate, personal spa facility can be booked for those who want to spend the day getting pampered in a more private environment. A nearby fitness studio is outfitted with treadmills, an exercise wall, and mats where regular yoga and Pilates classes take place. A personal fitness trainer is also available upon request. Be on the lookout for themed cruises. The MS Europa regularly offers cruises with special programming to suit music lovers, golf aficionados, and families traveling with children of any age. Compared to other luxury cruise lines, Hapag-Lloyd is particularly welcoming for children: three separate children’s facilities cater to children up to 15 years old, and a private babysitter is available in the evenings upon request. Golf cruises include shore excursions to some of the most beautiful golf courses around the world, and music cruises feature special entertainment options with guest musicians. Though there is no formal dress code on the MS Europa 2, passengers tend to dress smart, with designer labels peeking out of their resort wear. Most passengers dress formal for dinner, with men wearing slacks and buttoned shirts and women in formal dresses. You’ll find neither ball gowns nor sun dresses at dinner on this ship – the atmosphere is elegant, but not extravagant.